Although there have been multiple references to his birthday as being Friday the 13th or March 13th, his Official day of birth is considered, June 9th 1934. This is the same date that Donald made his debut into cartoons. Donald was introduced to the world as a bit of a jerk, in The Wise Little Hen (Cartoon in Link.) Donald has a very goose like appearance but rest assured he is the same good ol’ Donald. Two months later, Donald had his first anger outburst in Mickey’s Orphans. 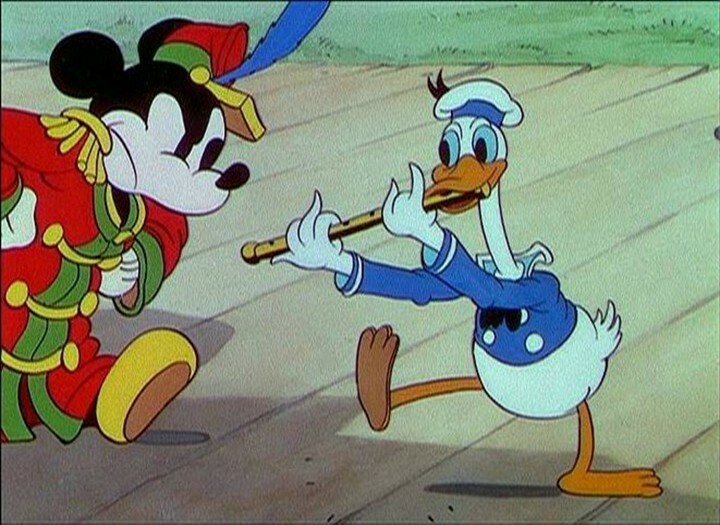 By 1935’s The Band Concert, Donald started appearing with the rest of the gang, most notably with Mickey and Goofy, since the trio’s different personalities meshed well for comedy. 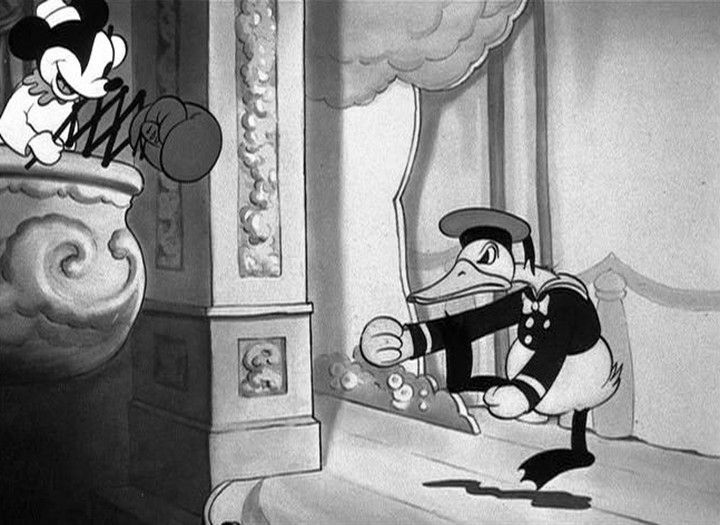 In 1936, Donald got a bit of a makeover, redesigning him more into the Duck we know and love today. This was also around the time Donald began starring in his own cartoons. His first one, the 1937, Don Donald, which also was the debut of a female duck. In the cartoon her name is Donna. His longtime love Daisy’s debut is in the 1940 cartoon, Mr. Duck Steps Out. Some people believe that Donna is Daisy. In both cartoons female’s voice is closer to Donald’s speech pattern. But this detail would change to make Donald more distinct. Is this Donald’s long time love, Daisy, going by a different name or a whole different duck? 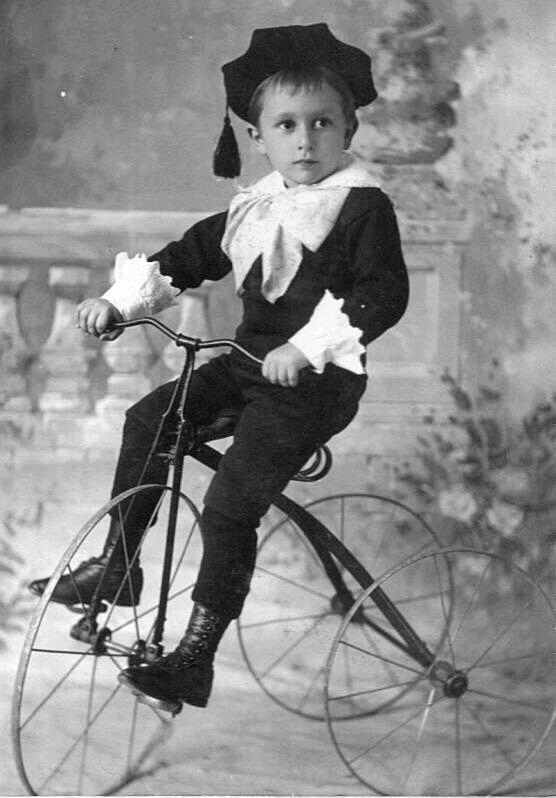 Donald is the only member of the fab five with a middle name, he gets his name from the term Little Lord Fauntleroy Suits. My Aunt might have had point about Donald’s popularity. He starred in more cartoons than Mickey Mouse during the 1940s and has also become quite political. Donald Duck appeared painted on the nose artwork of many Allied combat planes during World War II. 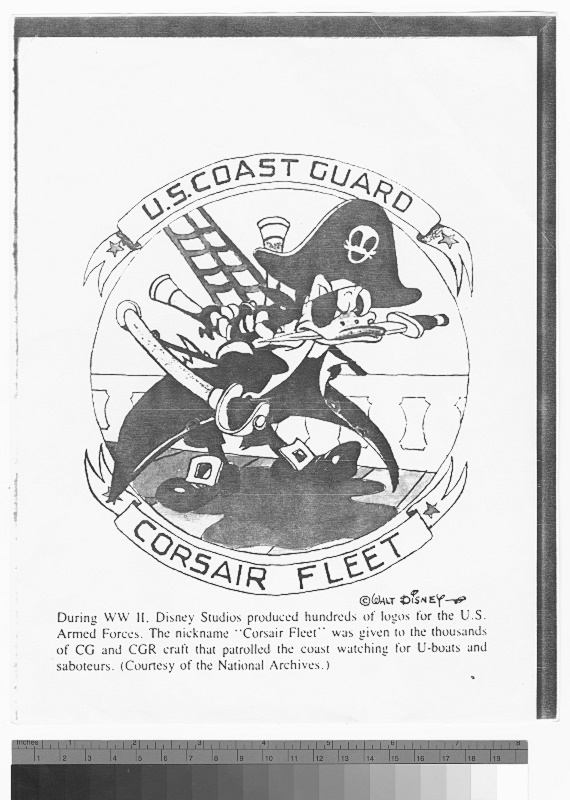 Walt Disney also gave permission and artwork for the fiery duck to be used as the mascot for the Coast Guard’s Corsair Fleet during World War II. In Sweden, the Donald Duck Party has been rather popular in politics over the years. The cartoon duck with a temper tested well among voters looking for a joke or better known as a “protest vote.” Back in 1985, he even got 291 votes. 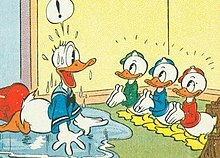 Donald is part of a large family, he has a twin sister, Thelma “Della” Duck, who is the mother of his three rabble-rousing nephews, Huey, Dewey and Louie. In a Dutch comic, it’s explained that Della is an astronaut who gives legal guardianship of her sons to her brother while she’s on a deep space mission. Out of his many Uncles, two of his more famous ones are the penny saving, former miser Scrooge McDuck and the brilliant, yet eccentric scientist, Ludwig Von Drake. Donald Duck has quite the filmography. 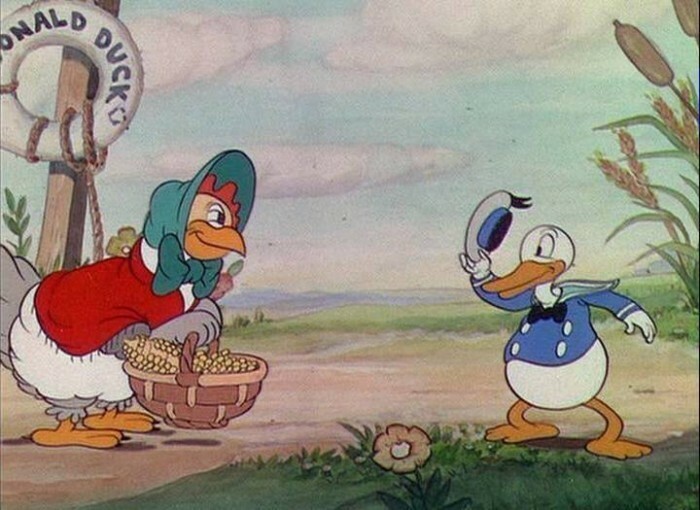 In addition to his shorts, Donald has made cameos in numerous TV shows and Movies, such as Ducktales, A Goofy Movie, Mickey’s Once Upon a Christmas and Who Framed Roger Rabbit. 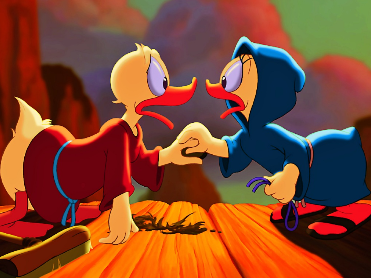 One of his more emotional roles came in Fantasia 2000, where he and Daisy are assisting in Noah’s Arc. In my humble opinion, it’s one of the most beautiful pieces in both Fantasia films, on par with The Sorcerer’s Apprentice. Another personal favorite and probably fan favorite would be The Three Caballeros. In Epcot’s Mexico pavilion, the original boat ride was a tour of Mexico’s history named El Rio del Tiempo (The River of Time). 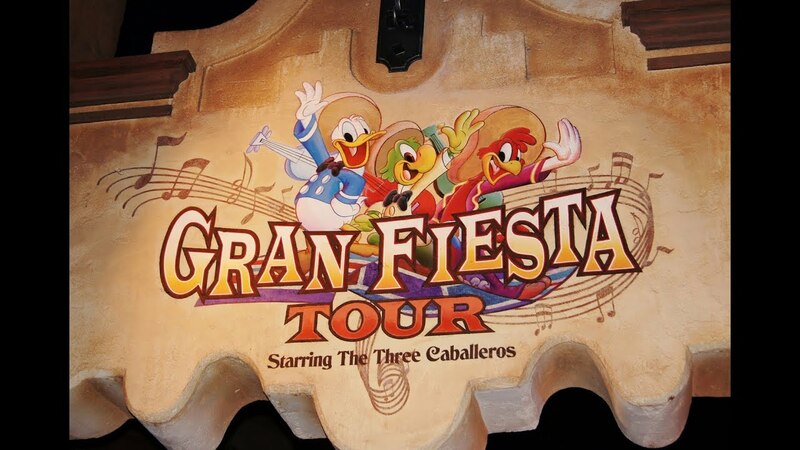 Nine years ago tomorrow, the ride was changed to the Gran Fiesta Tour Starring The Three Caballeros. Last but certainly not least, I’d like to end on what is probably my favorite portrayal of Donald. In 2002, Donald along side his good friend, Goofy, had a prominent role in the video game Kingdom Hearts. Originally, Donald was considered to be the main character but designer, Tetsuya Nomura wanted a human lead. 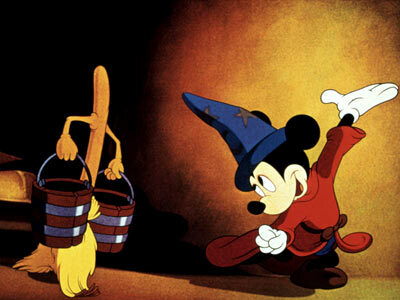 Donald, as the Royal court magician, sets out with Goofy to find King Mickey, who has disappeared. If you have yet to play this fantastic game, I highly recommend it, especially to any Disney fan out there. Thank you so much for Reading my post for D! I apologize for the lateness. I hope you enjoyed reading about Donald. May you dream in Disney. Nice post. Lots of fun history. Donald is great! Also I bought Kingdom Hearts and was so terrible at it I gave up but it looks like such a neat game! Your Aunt is right…Donald was a MUCH bigger movie star than Mickey Mouse ever was back in their day.